If the Gold / Silver Ratio is set to fall further, how could traders play it...? WHETHER YOU'RE in gold or silver, you should have enjoyed a happy 2009 to date, writes Julian Murdoch at Hard Assets Investor. As of last Friday's close, gold was at $1,056.40, up 20% year-to-date vs. the Dollar. Silver has done even better; it was up 56% to settle at $17.72 an ounce. The upward trend has many investors going long in both metals, but there's more you can do with Gold and silver than just buy and hold. You can also play the two metals off one another – but to do it successfully, you must first understand the ever-changing Gold / Silver Ratio. The Gold / Silver Ratio tells you the number of ounces of silver it would take to purchase one ounce of gold. And if you examine Gold and silver prices reaching back 100 years or more, the historical ratio most commonly quoted is 30:1, where 30 ounces of silver would have bought you one ounce of gold. But if you look at shorter periods, say the last 12 years for example, the ratio has held closer to 60:1, meaning that it takes lots more silver to buy one ounce of gold. And in just the past three years, the ratio has fluctuated from 45 to 85, driven by the volatility in the individual price of the metals themselves. Of course, looking at the ratio in a vacuum tells you nothing – it's just a number, after all. It's only after you factor in the dimension of time and the price movements underlying the number that you can make sense of the Gold / Silver relationship. 2.Silver increases more than gold does. This latter case is what we've seen so far in 2009. Since the beginning of the year, both metals have had great returns, but silver has outperformed gold, increasing 56% year-to-date, while gold only increased 20%. 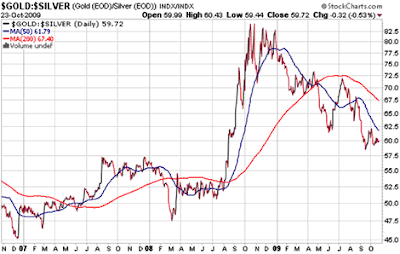 Consequently, that has pushed the Gold / Silver Ratio down. And just how low could the ratio go? Could it ever, say, return to its historical average of 30:1...? •Silver would need to almost double to $35.21 if gold held steady at $1056.40. In perhaps the most likely scenario for a lower Gold / Silver Ratio, gold would need to see some retrenchment, combined with continued strength in silver. The idea of gold plummeting back below $600 without affecting silver, or silver doubling to $35 with gold holding steady, is pretty outrageous. But there is some support for the possibility we might see silver gains decoupling from gold's coattails. Back when Gold broke the $1000 mark for the first time, in March 2008, silver was trading above $20 an ounce. Now, it's trading in a $16-$18 range. 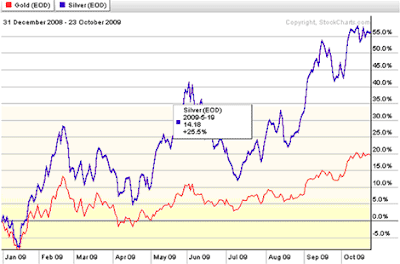 The disparity could indicate silver may be undervalued right now by historical standards. "Silver is set to benefit from stronger gold, but also the improving outlook for global industrial production." Meanwhile, the other side of the ratio, gold may not be able to sustain its current price levels, some industry analysts believe. In Harmony Gold's 2009 annual report, CEO Graham Briggs told shareholders recently that gold was still being affected by consumer and investor uncertainty. And in a recent Forbes article, David Wilson, an analyst with Societe Generale, stated that gold's weak fundamentals simply couldn't support last week's high of $1070.40 an ounce. Yet we still see experts like Jim Rogers predicting gold will soon hit $2000 an ounce. And with weakening gold fundamentals combined with forecasts of high prices, the ratio play right now may be that the Gold / Silver ratio stays on its downward path. Investors looking to play that trend have several options. Some die-hard precious metals aficionados approach the ratio literally, managing physical stores of the two metals based on ratio targets. Under this strategy, the ultimate goal is typically to increase the number of ounces of gold held, without any real regard for cash price. For example, let's say the Gold / Silver Ratio is currently at 60, but I think it's going to 30. I can then sell one ounce of gold for 60 ounces of silver, and when the ratio hits 30, I can use my 60 ounces of silver to buy back two ounces of gold. Voila! I have doubled my physical gold holdings. Of course, if the ratio goes to 120 instead, my 60 ounces of silver only buy me half as much gold as I'd originally held. In some ways, this style of trading feels a bit like playing the child whose older brother convinced him to trade his quarter for two dimes. A more traditional, but complex, financial strategy would be to make a precious-metals-neutral play. 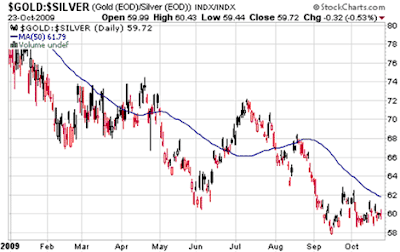 Sell gold short and invest – dollar-for-dollar – in silver. Overall, your exposure to precious metals, given that gold and silver often take similar paths, would be flat. One way to do this would be to sell short shares in the SPDR Gold Trust (NYSE Arca: GLD) and invest, dollar-for-dollar, in the iShares Silver Trust (NYSE Arca: SLV). Then it becomes a simple matter of adjusting your holdings depending on which way you feel the ratio will move. In this trade, you only lose money if gold continues to ramp up and silver stays flat, or if silver collapses. Should both metals rally, you end up even. Investors with a bigger appetite for risk (perhaps we should say speculators) can carry out the same play using options. Both GLD and SLV offer active options, and for the low price of $9.50 right now you can buy the right to sell GLD for $100 in January of 2011. Likewise, for $3.50, you can get the right to buy SLV at $17. Such plays are not for the faint of heart, of course, but if you're a true believer in the ratio and its continued reversion to that long-term historical average, it's definitely possible to put a lot of money to work that way. But as always, trader beware!